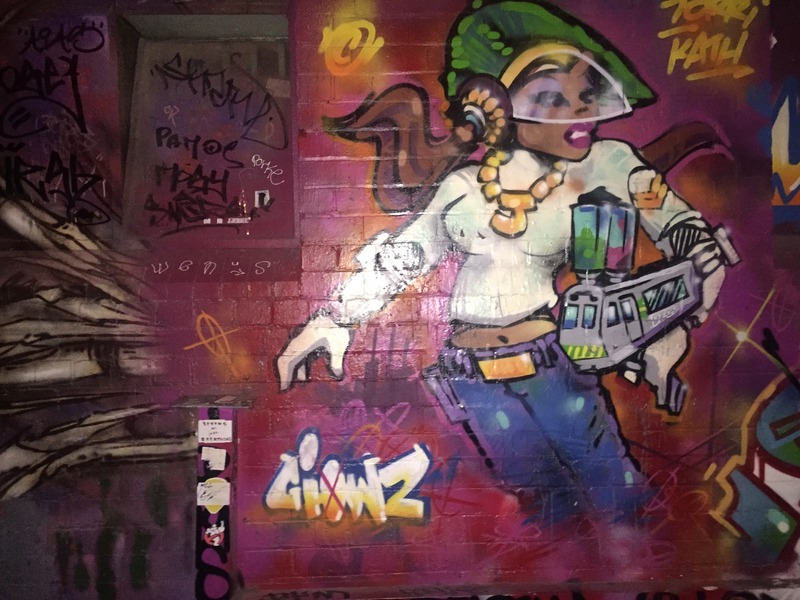 As you head north along Russell Street, appreciate the cityscape at night: hundreds of city-goers travelling through the CBD oblivious of the countless artworks hidden in shadowy corners and behind buildings. Croft Lane is a narrow, dark laneway, hidden off Paynes Place, behind garages and dumpsters. At night, the laneway is all dark apart from the odd streetlight and a string of red lights at the end, marking the entrance to The Croft Institute. The streetlights create small spotlights, sometimes cutting works in half and other times glorifying the works immediately below them. While the red string lights at the end of the lane serve a utiliarian purpose for The Croft Institute, they also serve a large role in the presentation of the street art. 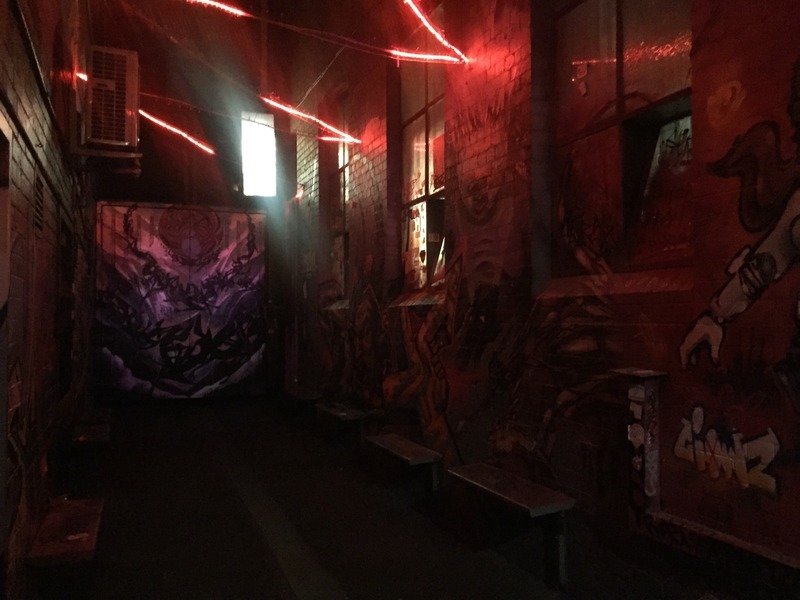 In Hosier Lane the multitude of neutral white lights allowed you to appreciate the works as they were created, the dark red of the end of Croft Lane transform the pieces beneath it. The sci-fi woman on the right, for example, was painted with bright greens, purples and whites, but at night is bathed in desaturated red hues. This has the overall effect of unfying the works in this laneway; despite the artists' intentions or creations, each of the artworks become part of one, larger piece. 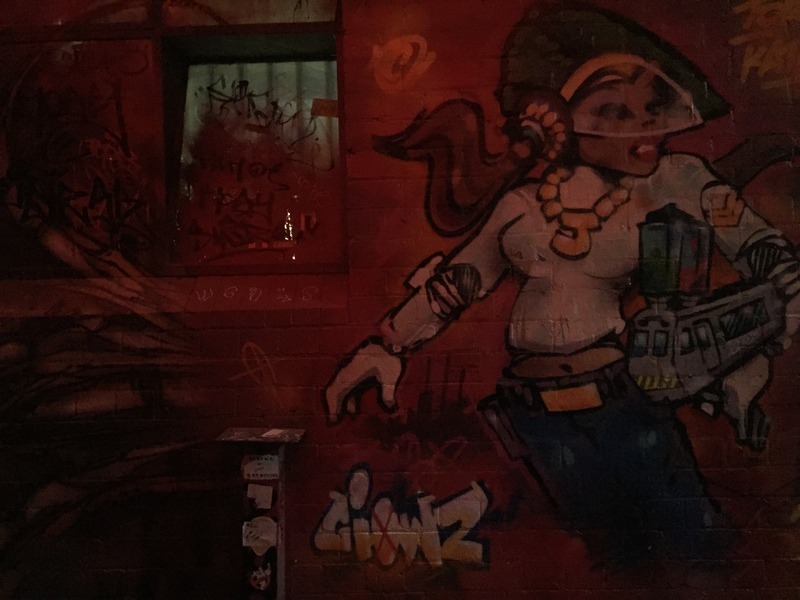 “Croft Lane,” Street Art deTours, accessed April 20, 2019, http://streetartdetours.com/document/1152.